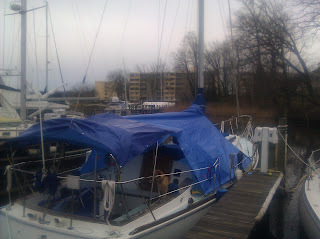 Yesterday I did a most "craptacular" job at tarping over the boat. Using cord was a hassle and difficult to adjust. I wasn't able to get the angles and tautness I wanted. Today I bought two additional tarps and set out to do a better job. I removed all the cord and went with my initial plan: bungie cords. 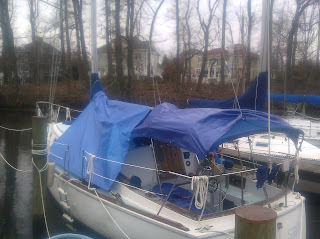 I used an entire bag of 18, and will need to buy more so I can add the third tarp on the foredeck. But today I did manage to tarp over the side decks and get the rooftop air conditioner covered--rain had come through it and onto my blanket a couple of nights ago. I also put a small tarp over the bimini; snow and rain can still settle there, so I will still need to knock any off, but it will ease the strain on the aging canvas and be far more water resistant. It's definitely darker inside with the tarp up, but the windows now provide a blue glow and it may provide a little bit of insulation to the boat; we'll see how it holds up. The bungie cord strategy makes it easy to walk to the outside of the tarp because I can pull the tarp away from deck edge with my toe before I step--cord would not provide that sort of "give." I can also scurry underneath the tarp along the side deck if I want; either way, it's not too difficult to get up to the bow to adjust lines if needed. The weather reports had predicted possibly 5 inches of snow accumulation, then this morning it was down to about an inch, and then it never bothered to rain or snow at all (as of this posting anyway). I credit that to my having put so much time and effort into tarping over. (You're welcome, Annapolis.) It's just like being in Miami, putting up all the hurricane shutters, and then barely getting a gust. It's the converse of the phenomenon where the bus only comes once you light a cigarette. On my way back from the hardware store I stopped at the SPCA. I had been told they sometimes have dog ramps that have been donated and they sell them very reasonably. To my surprise they had exactly what I was looking for and for $20 I went home with a ramp that would have cost me about $250 new. (Many thanks to whomever donated it and to the SPCA; this will make a HUGE difference for us and I could not have afforded a new one.) Buttercup took to it pretty quickly. It is not secured currently, but tomorrow I will pick up hinges and attach it to either the boat or the dock (I'm leaning toward the boat, so it will move with the tide and be easy to use when traveling). The other big task of the day was bailing out the sailing dinghy. A lot of rain in the past few days had filled it up and I was concerned about the predicted heavy rain and snow. A couple of days ago I had made a "bailer" (and a handy tub for mixing epoxy). I tied a good length of nylon cord to the bailer and around the forward bench of the dinghy. I had not actually gotten into the dinghy before, or used the swim ladder, so I asked a friend (thanks!) to come spot me in case I went overboard during this little exercise. I decided the best time to do this was after my run so my clothes would already be wet if I went in the drink. I knocked out a 6 mile run and luckily my friend warned me my running shoes would be waterlogged if I wore them in the dinghy. I went and swapped them for galoshes and glad I did--that water was icy! The bailer worked perfectly, the swim ladder held, and no one went for an unplanned swim. Three successes in one day! I really wasn't waiting for the other shoe to drop...but I think it did. I had the rooftop heat running and happened to glance at the ammeter and see it was on zero. The heater generally draws about 17 amps. I checked just in case I had accidentally put it on "fan" instead of "lo heat." Nope, the setting was on heat. But only cold air was blowing. I have an oil-filled radiator space heater, but it runs on my "main" electrical line with any other AC appliances/outlets other than the water heater and battery charger, so it limits how many electrical gadgets I can operate at once. I have two space heaters, but worry that together, and combined with powering the laptop, charging my phone, and playing the stereo, they would exceed the 24-amp limit for the line (it's a 30 amp line but it's ill-advised to regularly run more than 80% of its capacity). Then I was cooking dinner and chatting with a friend who stopped by and I noticed the sound of something running. Was it the fridge compressor? Yes, looking at the DC ammeter, 5 amps was likely the fridge and the other 2 the light in the galley. But the noise seemed louder than the fridge compressor and continued to cycle on and off. I had a sinking feeling... I flipped the breaker for the water pump and the noise stopped. The brand new water pump is now angrily, noisily, running continuously. My understanding is that it has a pressure-sensitive switch, so open pressure (from a faucet, or a leak) activates it. Now I will need to call the boat guy who installed it and get his help tracking down the problem...likely a leak somewhere. A couple of setbacks that concern me, but happy to have made other positive progress today. Just like when running a marathon, I have to keep moving forward no matter what. I have to remember that: to keep moving forward mechanically, financially, and emotionally, no matter what. Sometimes easier said than done. When I moved aboard I was stressed but happy to be moving forward in my life. I was happily single, not looking, considered myself "single but not available." It had taken me three years to fully recover from "the evil one" but I finally felt I could open my heart again, that I was done with any playing around, and that a real, long-term commitment would come along when the time was right. I was a fool to fall for the floppy-haired sailor guy. I actually put off projects I wanted to and should have completed when the weather was still good because I wanted to maximize my time with him before he left. In his time of need, I offered him everything I have to give. It is clear now I was an interesting new toy for a couple of weeks, and after than he hardly uttered a kind word to me. Now I am bruised and circumspect again. I just hope it doesn't take me years to pull myself back to where I was before meeting him. I have to remind myself every day that my pack and my boat come before any guy. I am just grateful to have them and to have wonderful friends, new and old. 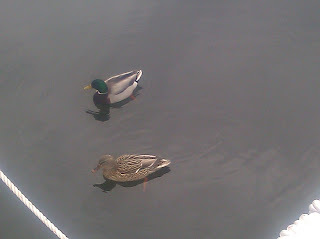 Here's a sweet couple who lives nearby.